On an early bird Amtrak train from Washington, DC to New York I sat across from Chase and chatted with him about the newest member of the Oak & Oscar family - the Sandford. A week had past since he debuted it to the world and I was curious about what was going through his mind... As we sipped lukewarm McDonald's coffee and watched landscapes and cityscapes whiz by, Chase opened up to me about the journey he's been on and the dream he's living right now. Earlier this year Chase did something he set out to do ever since launching Oak & Oscar: he quit his day job. Now, Instead of reporting downtown each weekday to a multinational firm, he leaves his house and walks a few blocks to his exposed brick-walled suite in a rehabbed loft building. About the lifestyle change Chase says, "I love the flexibility and freedom I get working for myself and I get to see my family and be part of my son's life far more than if I were still in the corporate world. But there's also significantly more risk involved and despite my reduction of "office hours" I'm still on call 24/7 to help answer questions and keep driving the brand forward. It's absolutely amazing and unbelievably terrifying and everything in between." But Chase really wouldn't have it any other way; he knows full well that working hard and making bold decisions come part and parcel with success. And look no further than the Sandford for proof that he's ticking all the boxes of being an entrepreneur: In less than two weeks all 100 limited-edition PVD examples sold out. When a product finally comes to life, the end result is what the market focuses on - how it looks, how it performs. In my opinion, the process and effort to go from idea to reality is too often overlooked. So, I was curious to hear Chase touch on what goes on behind the scenes running a boutique watch company - the not so glamorous side of the business. Chase revealed, "a lot of guys think I just come up with a design, order it and boom there it is. There's so much work, fine tuning, managing and involvement from beginning to the end. I almost make it harder on myself by designing each and every detail of the watch; from the case to the hands to the dial to the watch wallet itself. I've got super-talented folks helping me out, but I'm hands on in every scenario." Chase takes a lot of pride in delivering a watch with no shortcuts taken during development or its execution. That's why one of the hashtags he uses on the @oakandoscar Instagram account is #detailsmakethedesign. I can still recall the afternoon Chase received several much-anticipated prototypes in the mail - watches he planned to show off during his seven-city tour and send to online publications for photographing and review. The intensity of the lume wasn't quite to his specifications, which truth be told annoyed him a little bit. The fact that he wants even his pre-retail pieces to be perfect speaks volumes about his entire approach to Oak & Oscar. 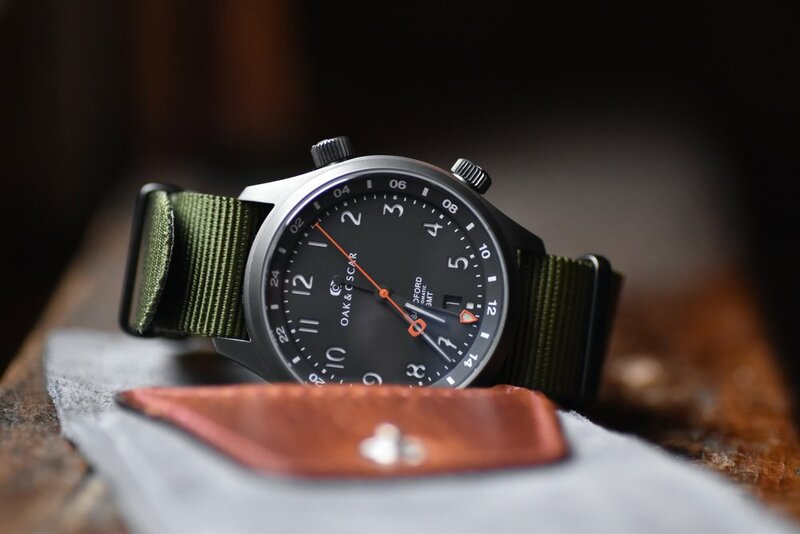 With all the buzz lately about the Sandford, I wanted Chase to reflect on the Burnham - his first watch: What's it like to know that 298 individually numbered Burnhams are out there in the universe being worn by supporters of yours and fans of its design? (#1 is locked away in his safe, #18 he wears.) 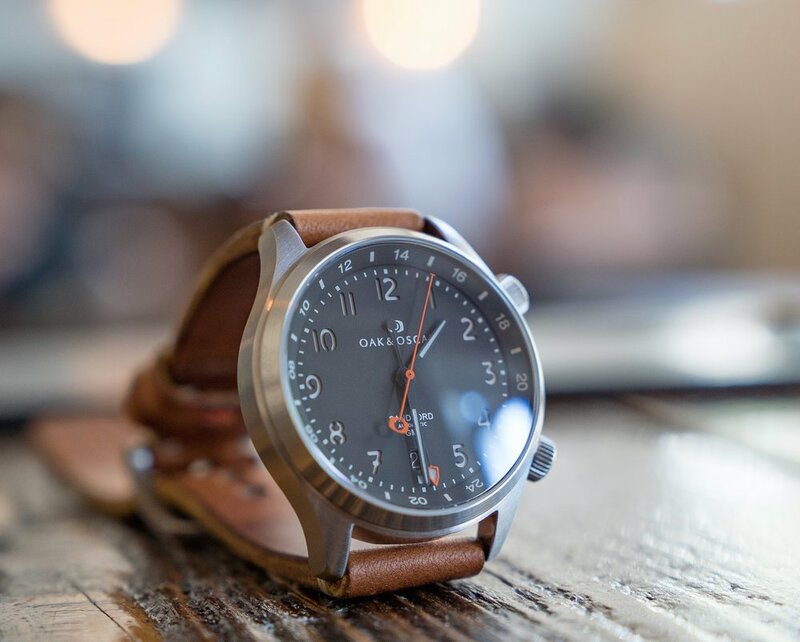 "When I see the Burnham on someone's wrist, it's still amazingly gratifying and humbling. I love knowing that the owner of that watch has traveled with it, worn it, beaten it up (or babied it) and they take pride in it. I love hearing stories from owners and how they connect with the watch and the brand. It's such a cool feeling to see your creation on others' wrists," replied Chase. Sandford preorders are still a few months from being delivered. But this recent road trip allowed Chase to get a sneak peak at the Sandford on peoples' wrists. I was one of those wrist models. And I'll say this about the 40mm Sandford: I felt a connection to it functionally, aesthetically and emotionally. It has the DNA of Oak & Oscar with its grey toned dial and orange second hand with trademark barrel-shaped counter balance. But at the same time it's an entirely different watch. I'll refer to a car analogy from Jason Fried to better articulate what I mean about the Burnham and Sandford. Talking about Corvette designs, Jason says, "there’s a spirit to it. And even though they don’t all look the same over the years, there’s a language and an idea behind the Corvette which stays in the DNA of the car." I can't help but end this article with words of advice Chase received from his dad back when he was at a crossroads whether to move forward with the Burnham or set the project aside. Paraphrasing, Chase's dad said, "What would you tell your future kid? Would you say, 'play it safe' or would you tell them to go for it and try? Go for your dreams and see what happens..."
Photo credit: Feature image courtesy of @thepaullewin. In article, from top to bottom, photos 1, 2, 5 and 6 taken by @sophisticatedrogue. Photo 4 was taken by @thepaullewin. Picture 3 and all pocket shots by the author.